Founded in 2014, Drift is one of the world’s leading conversational marketing and sales platforms. 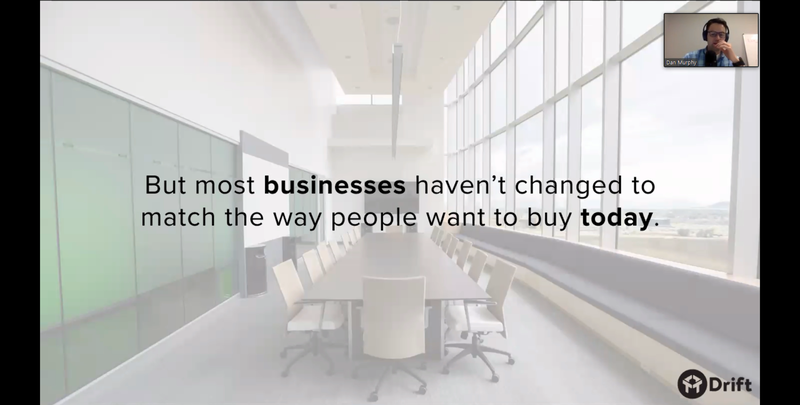 Their customers use Drift to provide a modern buying experience for potential customers, generate more qualified leads, and dramatically accelerate the sales cycle. With a strong statement like that, Drift follows through and proves their commitment to better communication, truly connecting with their audience by running customer education and partner webinars each week. Webinars are also such an integral part of Drift’s lead gen strategy that they plan them out months in advance. This kind of dedication got my attention, so I talked to Dan Murphy, Demand Gen Team Lead at Drift, to get a behind-the-scenes look at their webinar process in order to better understand how they’re succeeding with webinars, getting 2–3x more qualified leads than other channels. I also talked to Alex Orfao, Conversational Marketing Manager at Drift, to learn about some of their awesome webinar stats, such as an average of 55% click-to-registration rate, as well as a 35%–40% average show-up rate. I’ll expand on those stats and more later, but let’s start at the beginning and talk about the reason Drift began running webinars, and learn a bit about their webinar dream team that allows them to be flexible and move fast. As mentioned, Drift started running webinars to qualify leads. They had a premium funnel that was generating high quality leads, but they had no system in place to quickly and efficiently identify them. Webinars fit this need perfectly, as they found their most qualified leads ended up on webinars. More than that, the webinars only took 30 to 60 minutes and provided a host of other benefits, which we’ll discuss later. As far as their webinar team composition goes, they have one person, Alex, who handles the bulk of the prep work. Alex does everything from setting up the webinar to marketing it. This includes finding the right partners, planning the webinar with them, finding the right marketing angle, promoting the webinar (see below to learn how Drift promotes their webinars), and setting up the technical side of the webinar. She even runs some webinars (go Alex!). Besides Alex, there’s a few other people from the team who join the webinars from time to time: For bigger webinars as well as partner webinars, this includes Dave Gerhardt, Drift’s VP of Marketing, and David Cancel, the CEO and co-founder. This helps attract more people to the webinars, as they both have large followings. The team has a standard deck and info for most webinars, which allows team members to come in and participate, or even run many of the webinars. This is a great way to ensure their process isn’t dependant on any single person. Drift runs two types of webinars: comarketing/partner and customer education. I asked Dan to tell me a bit more about each. Every other week, Drift runs a webinar where they partner with a similar company to bring their audience specialized, high level training in a helpful topic. These webinars won’t be found on Drift’s main webinar page, as they create a dedicated page to promote the event. Sometimes their partner will create the dedicated page, but regardless, they both promote the webinar. On these webinars, there’s at least one person from each team present. As mentioned before, sometimes Drift’s VP of Marketing and/or CEO will join the webinar depending on the size. Their goals with these webinars are to identify and qualify leads while driving them to try out Drift. They also create valuable partnerships with other similar companies in their space, which opens doors to many other possibilities as well. In between partner webinars, they run “Drift Overview” webinars where they train their current and prospective customers on how to get the most out of their platform. These are the webinars you’ll find on their main webinar page. While the webinars are angled as product training, each webinar typically has a special offer for live attendees that you won’t find anywhere else on their website. This is where Drift identifies their most qualified leads, but Dan said it’s also about nurturing them. They really try to zoom in further to understand them so they can better identify the right customers and pass them off to their sales team. 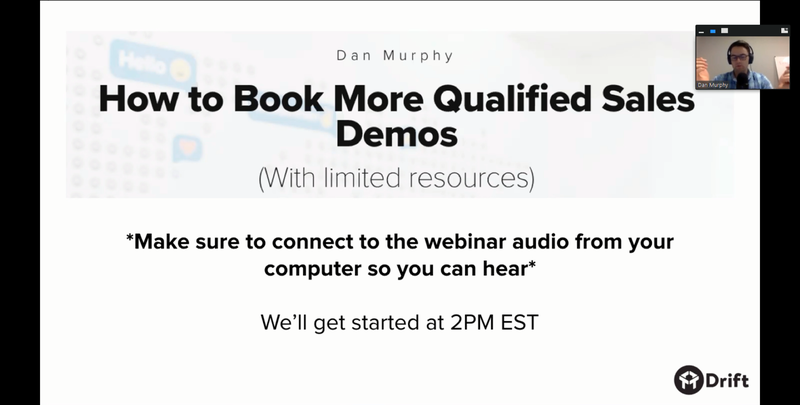 I asked Dan about their most popular webinar topic and he said out of all the webinars they’ve ran consistently, their How to Book More Qualified Sales Demos webinar has been the most popular thus far. He says this is most likely because every marketer and salesperson needs to increase their velocity. If you can help people get more qualified sales demos, you’re helping them out a lot. 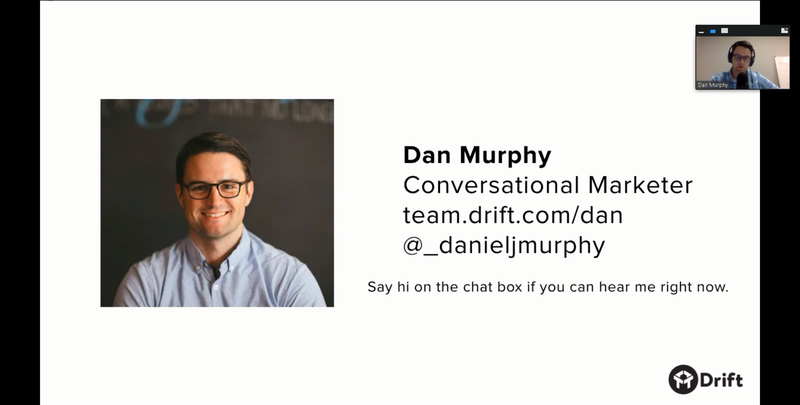 Although people love the material and takeaways of the webinar, Dan says the story of Drift and where they came from is the most popular part of it. The old world of B2B marketing isn’t working, and that’s where Drift comes in. Their whole mission is one of the main aspects that resonates with their customers. While Drift started webinars for lead gen and qualification, they ended up getting much more. One of the biggest benefits for team members running and participating on webinars is they get to connect with customers. Dan says it’s easy to get lost in your own thoughts and data, but speaking directly to your current and potential customers helps the team both understand their customers on a deeper level, and become better marketers overall. They usually get 10–15 attendees in each Drift overview webinar who ask questions and engage with the presenter, which has been incredibly helpful for generating user feedback in real time, and allows the presenters to have deeper conversations with their prospects and users. The feedback they receive is often directly used for different types of content, whether it’s blog posts, videos, social media posts, marketing campaigns, or other webinars. This is highly valuable, as they don’t have to guess at what their audience wants to see; they can just listen to the recurring things they hear on each webinar and create content around it. A key thing to note is that attendees won’t always be so active in the chat during a webinar. Being masters of conversation, the Drift team takes care to keep their audience engaged during their webinars so they feel like they’re part of the event instead of a passive audience. To drive traffic to their webinars, Drift mainly uses email and social media. Other smaller traffic avenues include LinkedIn and general site traffic from things like announcement bars. They even have an ad on their login page for their upcoming Drift Overview webinar, which pushes their users to sign up and learn how to use the platform more efficiently. 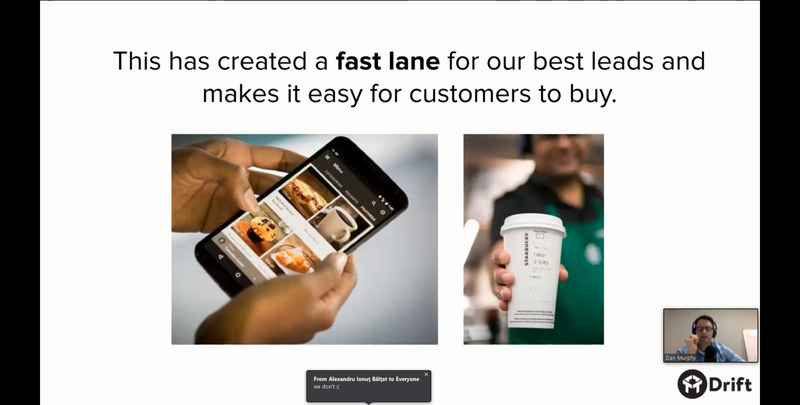 They’re also experimenting with new areas such as in-app messaging to free users, pushing them to Drift overview webinars in hopes to convert them to paying customers. Now that we’ve looked at why Drift runs webinars, what types of webinars they run, and how they drive traffic to them, let’s go over their registration process to see how they handle leads from registration to the webinar. I’ll only be breaking down their customer education webinars because each of their partner webinars can be quite different depending on the partner and topic. 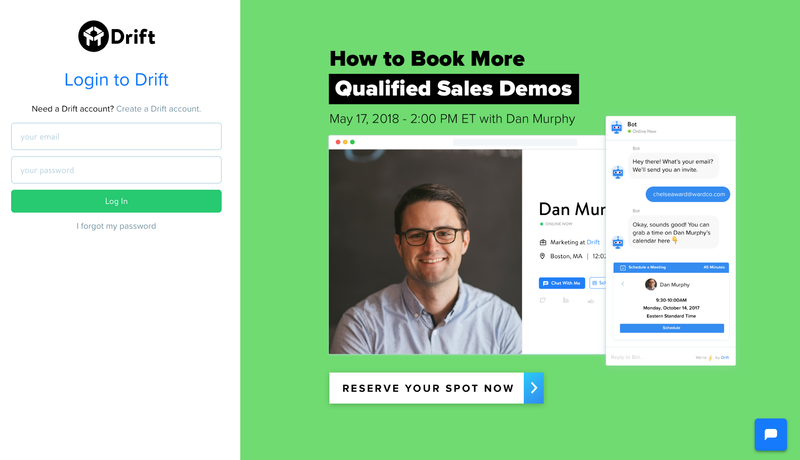 When you arrive at Drift’s dedicated webinar page, you’ll immediately see the info for the nearest upcoming webinar in the header, which at the time of writing is their popular How to Book More Qualified Sales Demos webinar. Who doesn’t want more qualified sales demos? It’s a simple title that packs a lot of potential value. Below the header is a fantastic detailed explanation of what the webinar is all about and exactly what attendees are going learn on the 30-minute webinar. 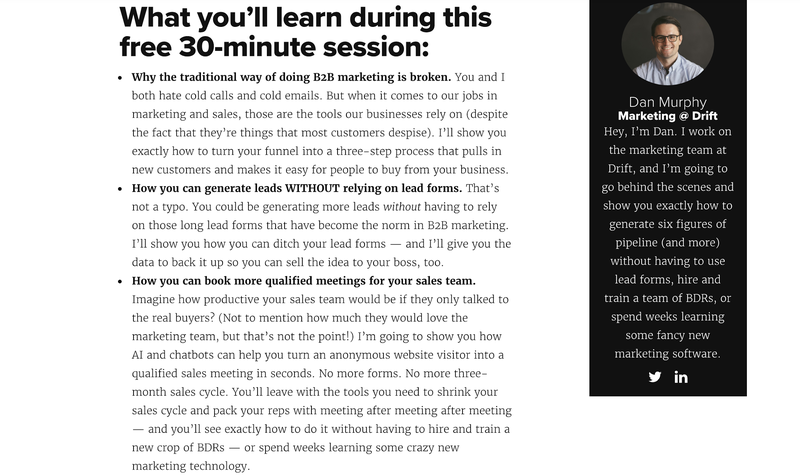 Wait, only 30 minutes to learn how to get more qualified sales demos? How can you say no to that? The first point concerns Drift’s mission, which, as noted before, is of great interest for most of their target customers. Those who feel similarly about the traditional way of doing things will likely be drawn in from the start, especially if they’re interested in getting more demos. 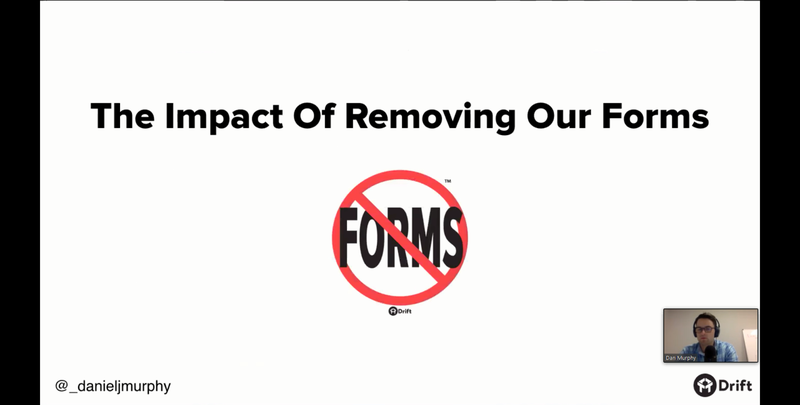 The second point stems off of the first and let’s you know they’re going to teach you how to get rid of pesky old forms so you can generate leads faster and more efficiently with a modern system. This not only enforces the first point, but also tells you some specifics on how they’re going to fix the old, broken way of B2B marketing. 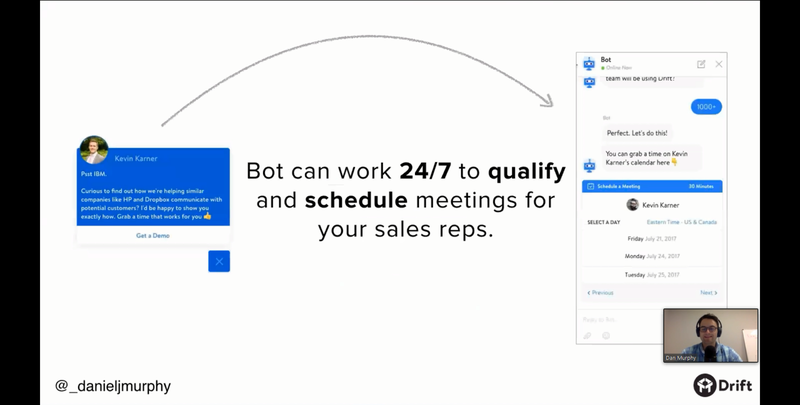 Lastly, they talk about moving forward and how you can have a more productive sales team by talking to real buyers, and how Drift can help you do that with AI and Chatbots. They can “help you turn an anonymous website visitor into a qualified sales demo in seconds.” That’s a big promise, but it definitely grabs your attention! 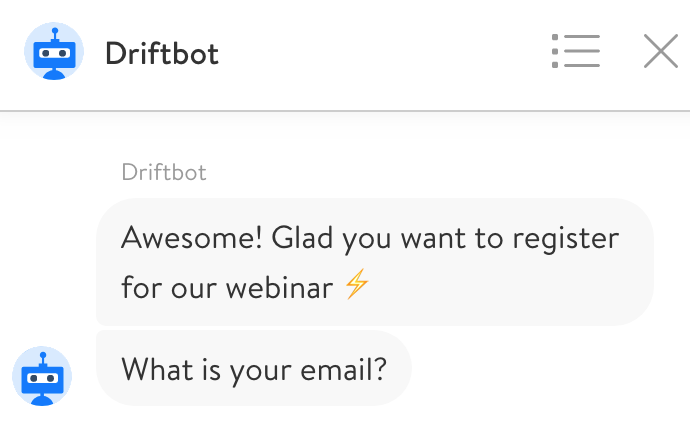 After signing up for the webinar, Driftbot pops up and helps get you registered for the webinar. After entering your email address, it sends you all the information you need for the webinar, and let’s you know that a confirmation email with the same info will be sent soon. What better way to learn about Drift’s webinar process than to breakdown their most popular webinar? I hopped on one of their How to Book More Qualified Sales Demos webinars to see the magic in person, and I took a few notes that I think will help you get a better understanding of their live webinar process. Let’s dive in! The webinar begins a few minutes before the start time, and Dan pops up to say hello to everyone, then chats a bit with the attendees before starting his presentation. Dan introduces himself, then asks everyone to send him a quick message in the chat to ensure everyone can hear him. 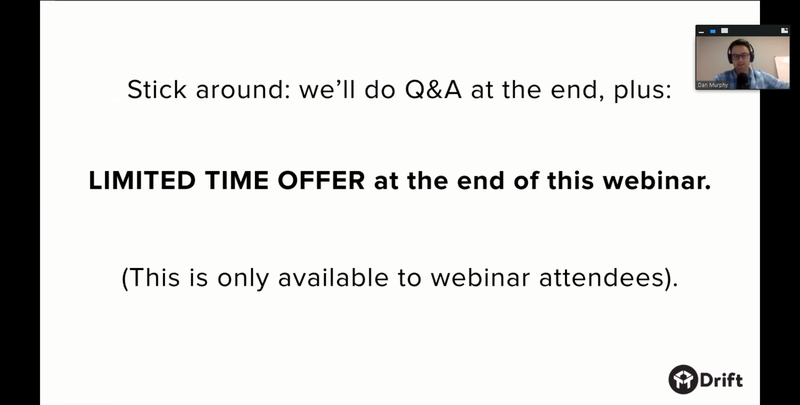 He mentions everyone should stick around for Q&A at the end, as well as a limited time offer that’s only available to live webinar attendees. This is a great way to keep the audience focused and increase their overall webinar time. 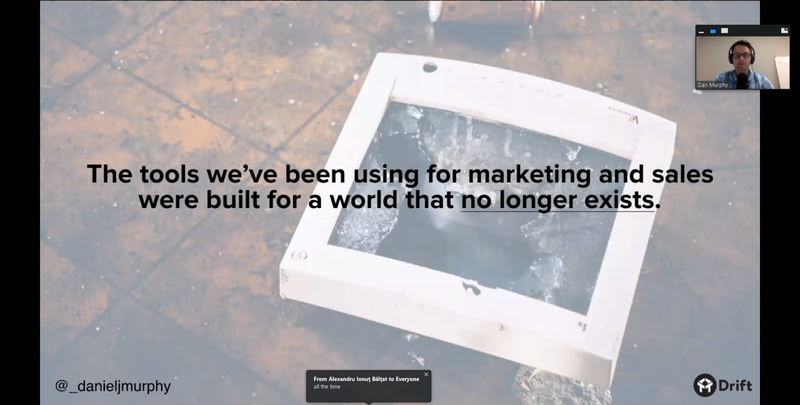 He then drives his point further home by explaining that the tools everyone has been using for marketing and sales were built for a world that no longer exists. This is a bold statement, but Dan has proof to back it up, as well as a solution. 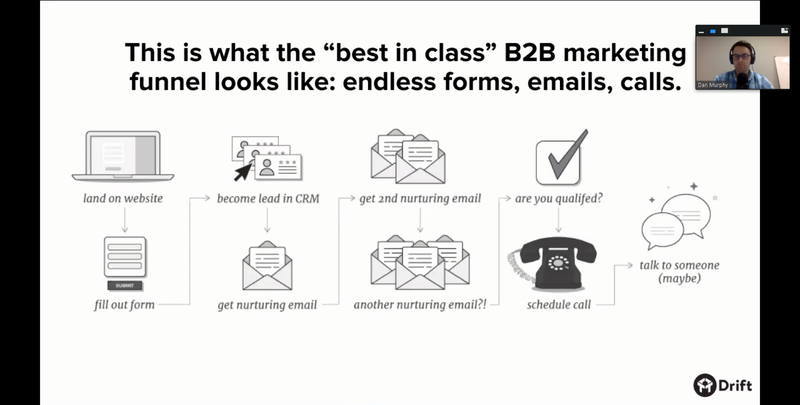 Dan then shows a chart of the current “best in class” B2B marketing funnel and explains the flaws with it. He discusses how buyers have all the power today because information is free. Dan urges attendees to think about the way they communicate and compare it to how businesses communicate. He goes on to say it’s like “spending a ton of time and energy to get people into your store, only to hand them forms to fill out before you talk to them or sell them anything.” But then, once someone leaves, you start to call and email them like crazy. It’s a terrible experience for everyone involved, even the sales and marketing teams. The current solution to this problem is typically just to throw money at it, but does that really accomplish anything? Dan asks everyone to think about why you would spend so much time and energy, only to make our customers jump through hoops to speak to a real person. 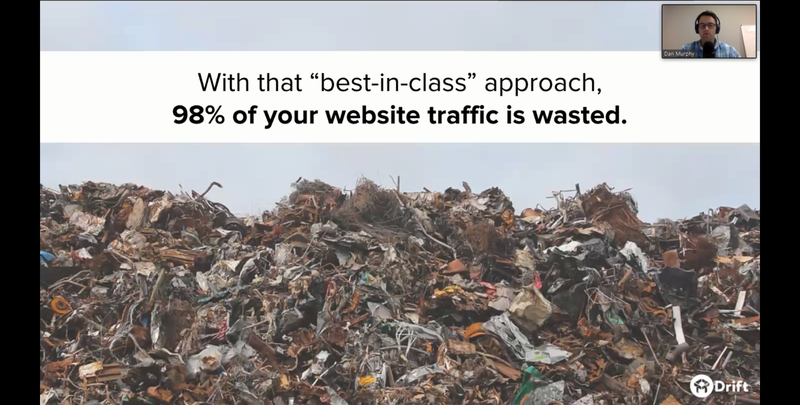 In fact, Drift did a study and found that on average, 98% of website traffic is wasted with this approach. Dan then shows some data from research Drift and other companies have done on response time. 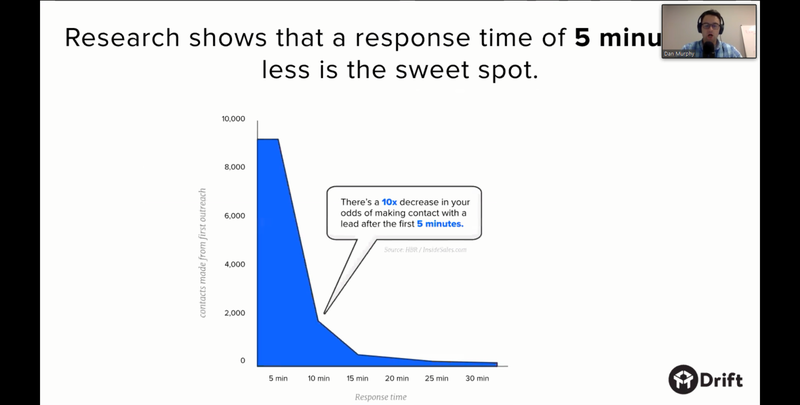 They found that five minutes or less was the sweet spot for responding to leads, only 7% of 433 companies surveyed responded in five minutes or less, and 58% ghosted them, never engaging with leads at all. Conveniently, Drift was created specifically to solve this problem. They focus on real-time conversations to remove friction from the buying process and close more leads. He then talks about the modern marketer’s new secret weapon: chatbots. They can qualify leads and schedule meetings for sales reps 24/7. They can also be customized to match certain rules that matter to your business. This might sound a bit complicated, but Dan ensures attendees that anyone who has created a Google Form or Typeform Survey can easily create a chatbot. He demonstrates this by going over a few slides of the chatbot setup, explaining how quick and easy it can be. He also shows how much faith they have in their product by showing off some of the places they use Drift at their own company. Dan then moves on to a little experiment they did where they removed all of their forms. They quickly started generating 20% more leads via conversations using Drift, versus the best-in-class marketing strategy using forms, which converts at 5%. Conversations via Drift are now the #1 source of their booked demos, with 43% of them coming from conversations with website visitors. Dan says this is because VP’s and above are less likely to fill out forms, as they prefer to talk to the businesses first. He tells a story about why he goes to Starbucks because he can order on his phone from the office, and then walk downstairs and pick up his coffee without waiting in any long lines. He says he even used to be a religious Dunkin Donuts drinker, but now he only drinks Starbucks because of the convenience. After the Starbucks story, Dan shows another powerful quote from their CEO and a bunch of tweets from happy customers talking about Drift, and tells attendees they can go to drift.com/love to see many more Tweets from other customers. 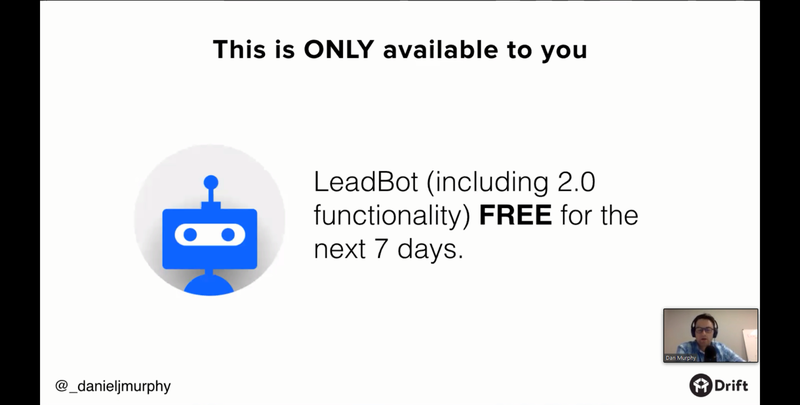 Lastly, Dan shares his special offer that’s only available to attendees — free access to their LeadBot for the next 7 days. This is a no-brainer deal for attendees who aren’t already customers, as it allows them to try out the Drift platform and implement everything they just learned with no pressure. When I asked Dan about what Drift does with their recordings after the webinar, Dan got excited to share some things they plan on experimenting with soon. He also gave some great tips on sharing the recording with registrants, which I go over in the conclusion. Drift’s goal with their webinar recordings is to start a conversation by having registrants email them for the recording, or reaching out via email and asking if registrants would like the recording. From here, they ask questions and build a relationship with the person in order to learn more about them to provide as much value as they can to that individual. The part Dan is most excited about is that Drift is looking to use email bots to handle this follow-up flow in an effort to work towards becoming an email platform built around conversations. The platform would allow users to look at the replies and see areas they need to improve so the bot becomes more effective over time. Dan said these are some things they’d like to experiment with, but it sounds like Drift is committed to being at the head of conversational marketing and will likely have a lot of cool stuff coming out in the future. One person on the Drift webinar team, Alex, works on setting up the webinar. 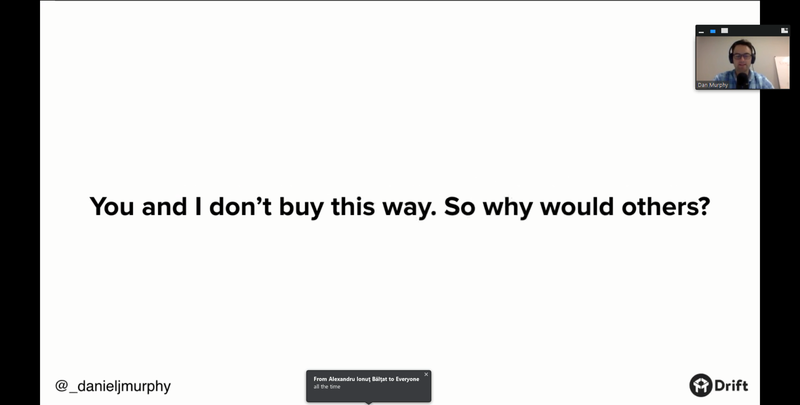 Depending on the week, this is either a customer education or comarketing/partner webinar. The customer education webinars are general overviews of the Drift platform, but also have a specific high-value angle and goal, such as How to Book More Qualified Sales Demos. For partner webinars, Alex finds similar companies with similar audiences that want to do a webinar with Drift to teach their attendees some valuable lessons around a topic that appeals to both of their audiences. Customer education webinars are hosted on Drift’s webinar page and for comarketing webinars, Drift or their partner company creates a dedicated page to promote the webinar. After setting up the behind-the-scenes of the webinar, Alex works on promoting it to their audience. The bulk of their traffic comes from email and social media, with a little bit coming from other sources such as LinkedIn and their app login page. For comarketing webinars, the partner company also promotes the webinar equally. The traffic goes directly to their webinar registration page, where they like to keep it simple. The header contains a compelling webinar title, along with the date and time. Below the header is a few paragraphs explaining exactly what attendees will learn during the webinar, along with a short description of the host(s). 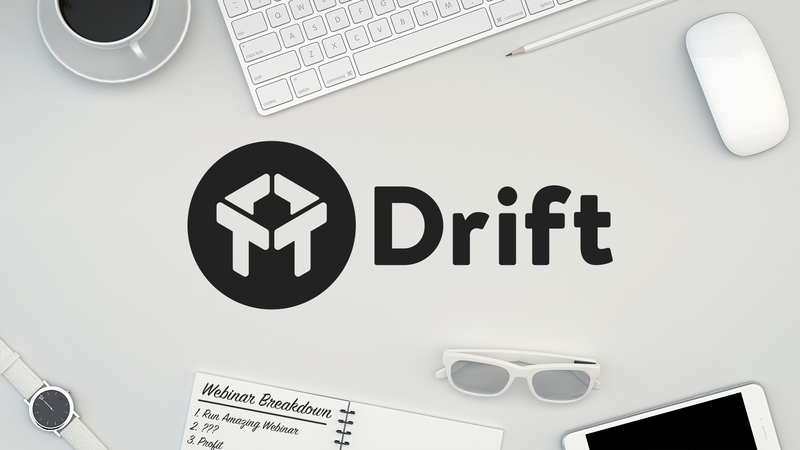 To sign up for the webinar, Drift uses their Driftbot. Clicking the registration button brings up a chat with the bot, where it asks you for your email. After entering your email, Driftbot sends you all the necessary information on the webinar, such as the date, time, and join links. It also sends you a follow-up email with the same info. When it comes time for the webinar to start, the host sometimes hops on a bit early to chat with attendees and give everyone else a few minutes to join before introducing themselves, the topic of the day, and diving into the presentation. Partner webinars vary, but customer education webinars are usually an overview of the Drift platform where the host not only teaches about Drift’s products, but also their reason behind creating them. 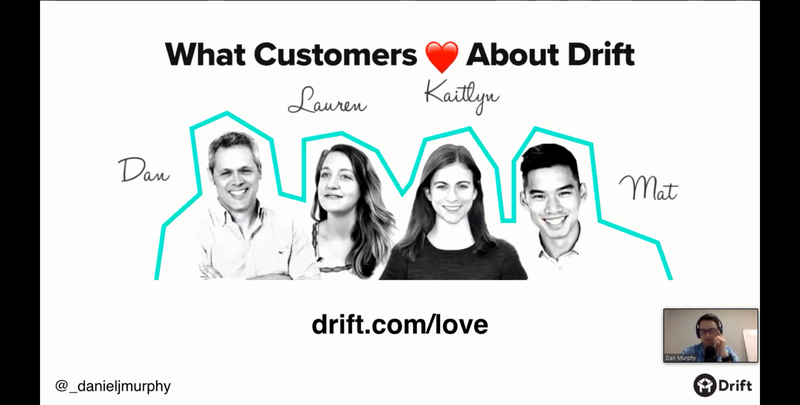 Many of their best customers share the same values, and this is likely a large part of why many ultimately decide to try out the Drift platform. 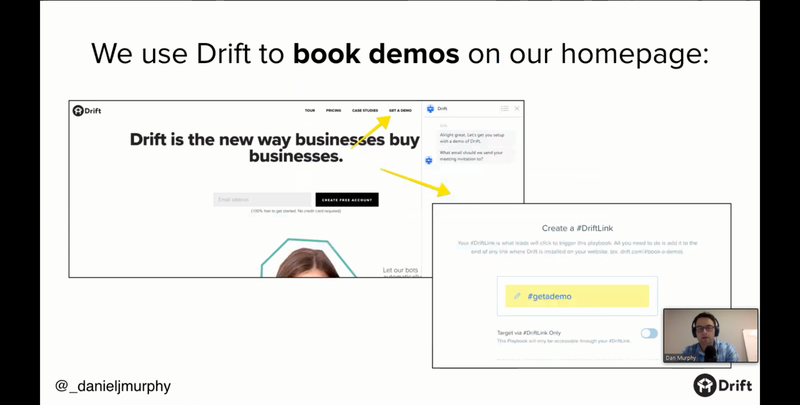 Speaking of trying out the platform, Drift usually has a no-brainer offer at the end of their customer education webinars for attendees that haven’t yet tried it out. They introduce the (free) offer after showing tons of social proof from Twitter, as well as a slide with some of their most notable customers. 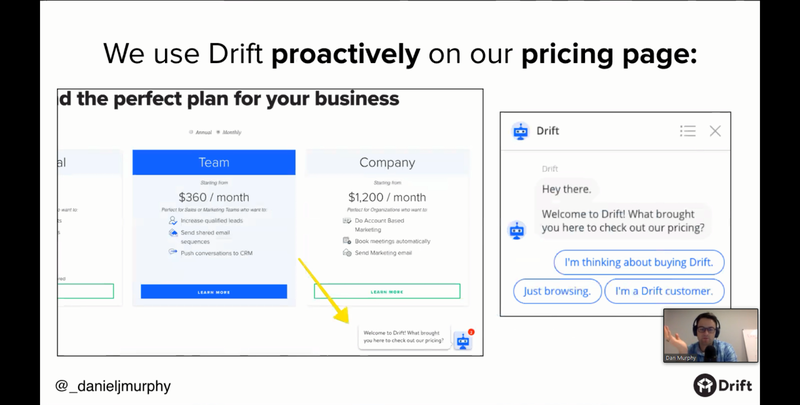 After the webinar, attendees can email the host to get the recording and/or special offer, where Drift will try to start a conversation with them in an effort to build a relationship and provide as much value as possible. Webinars are an integral part of Drift’s lead gen process, sometimes even having webinars scheduled for months in advance. And while their webinars were originally just for lead gen (and still the main reason they run them today), the Drift team enjoys other benefits such as strategic partnerships with similar companies, as well as real-time feedback and an overall better understanding of their customers. At the end of my interview with Dan, I asked him for any good tips he has for others that want to achieve success with webinars like Drift has done. He had a lot of great stuff to share, and his first tip had to do with repeated webinars. These are webinars such as the Drift overview webinar, where they run the same webinar every other week, and promote it often. Dan says doing a webinar every two weeks can get you into a great cadence and help you slowly perfect your presentation and pitch. He says he’s seen the quality of his webinars increase over time as he developed his cadence, and now it seems like the audience is always engaged during the webinar, which is another great tip of his. 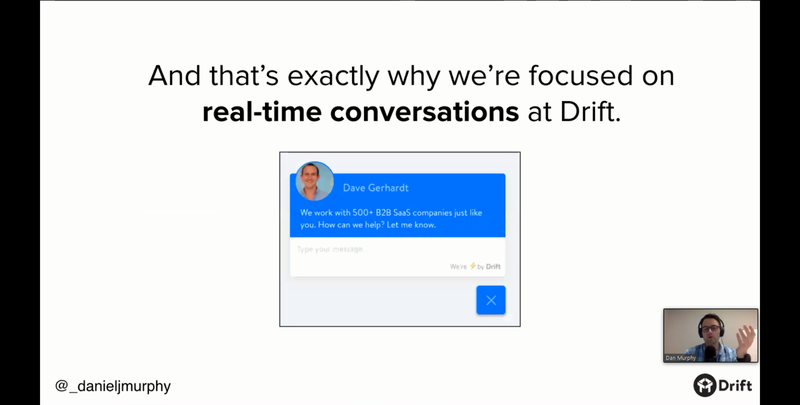 Drift optimizes for replies in order to strike up a conversation with their prospects and customers. Dan says webinars are no exception for this, and in fact he highly encourages webinar hosts to keep their audience engaged to keep the conversation going during and after the webinar. For instance, Drift records most of their webinars, but don’t automatically send the recording link to everyone right after the webinar. Instead, they email registrants and simply ask if they can send the recording to them. All they need to do is reply with “yes” and they’ve started a conversation. 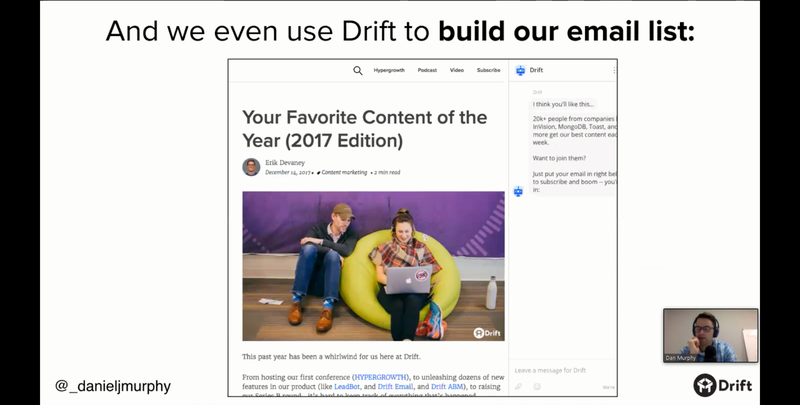 Then Drift can start asking questions such as “how did you hear about us” and “what did you think of the content on the webinar?”. Dan says the last thing you want is a dead email that goes nowhere. You have a great opportunity to follow up with people who have take 30-60 minutes or more out of their day to watch a presentation of yours, so there’s no reason to not capitalize on that. Dan did say that this isn’t super scalable considering each conversation is unique, but he also says companies often overlook continuing the conversation and the value it can bring to both their company and audience. Another tip Dan offered up was one that I’ve often seen overlooked by many companies running webinars. It goes with the old “quality over quantity” adage. Often people get lost in the volume of webinar registrants and attendees when they should be focusing on the quality instead. If you get ten people in a webinar, they can be insanely valuable. Drift is great at building deep relationships with these leads, where 9 out of 10 attendees can be ready to buy. Dan says they’ve also noticed that webinar-generated leads are two to three times as qualified versus other channels. So don’t treat it like a numbers game, and focus on providing as much value as possible to your attendees. Thanks for reading, and a huge thanks again to Dan Murhpy and Alex Orfao for sharing their time and knowledge with me to make this article possible.